1916-D Mercury Dime 10C Coin - Certified PCGS VG8 - Rare Key Date Coin! It is difficult to find a 1916-D this nice - Most rate G4 or lower. Quite a scarce Classic Coin! As good as it gets.". "Exceptional service. Straight up.". 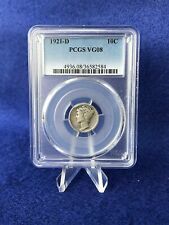 1921-D Mercury Silver Dime 10c PCGS VG8 BETTER DATE coin!!! Grading coins is an art and every person grades differently. I try to be as accurate as I can and to the best of my ability. Nice problem free coin. This honest circulated coin still has nice strike detail and has good eye appeal for its assigned grade. Condition: PCGS VG8 Very Good. Year: 1921. Semi-Key Coin . Ozark Currency and Coin. 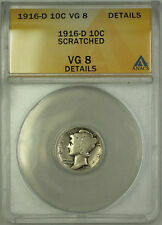 1916-D Mercury Dime 10C Coin - Certified ANACS VG8 - Rare Key Date Coin! Quite a scarce Classic Coin! As good as it gets.". "Exceptional service. Straight up. ".